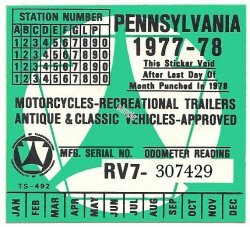 Pennsylvania 1977 cycle Inspection Sticker - $20.00 : Bob Hoyts Classic Inspection Stickers, Add a Final Touch to your Restoration! This 1977-78 PA Motorcycle Inspection sticker was restored and reproduced directly from an original. This is a 1977-78 PA Inspection sticker (MOTORCYCLE) This reproduction has been carefully restored and reproduced front and back directly from an original.